When I purchased my copy of Shadow War: Armageddon, I wasn't planning on writing a series of articles. However, the nature of the beast means that's exactly what's ended up happening. The launch of the game comes with a hell of a lot of baggage, and I felt it was all a bit too much to squeeze into a review. So, the other day I talked about the bloody mess of Armageddon's launch. Today, I'm going to talk about Armageddon's terrain. For many people, the terrain is going to be the most important thing about the game. I certainly believe it's the most important thing about the game as far as Games Workshop is concerned. And I'll say this now: It's lovely. It's huge, surprisingly heavy, imposing, incredibly detailed, and you can put it together in almost limitless combinations. It's terrain to get excited about. And I never get excited about terrain. But as I started clipping out the scenery pieces and thinking about the various ways to put it together, several... issues... became apparent. Not problems, as such. Just... issues. The first thing I noticed is that I had mistaken modular for reconfigurable. I had seen pictures of the various components clipping together, and I had got it into my head that you could pop the pieces in and out easily to create a different battlefield every time. The pieces are held together underneath with plastic clips that have a tendency to fall out. And there's nothing to hold the various pipes together at all. 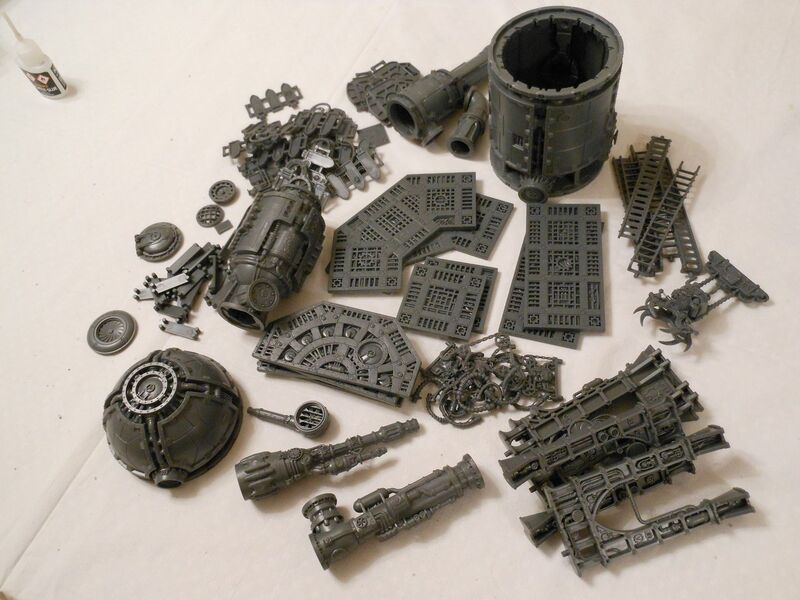 Slightly perturbed by this, I looked into it a bit more, and found that in the April issue of White Dwarf that showcases the scenery, Games Workshop does indeed recommend gluing everything together, because constantly separating the parts is likely to weaken the pins and cause breakages. Unfortunately, in my opinion, the instructions for assembling the scenery included in Shadow War: Armageddon show one of the least efficient configurations. If you follow the guide, you end up with a furnace with a platform on top of it, a second larger platform, and a walkway to connect the two. The layout is about 2 feet long by 10 inches wide, and looks great as the centrepiece for a battlefield; but it really doesn't feel like using the terrain to its full potential. Unfortunately, that potential isn't as great I was hoping for. Despite the massive amount of components, the actual usable terrain is surprisingly limited. 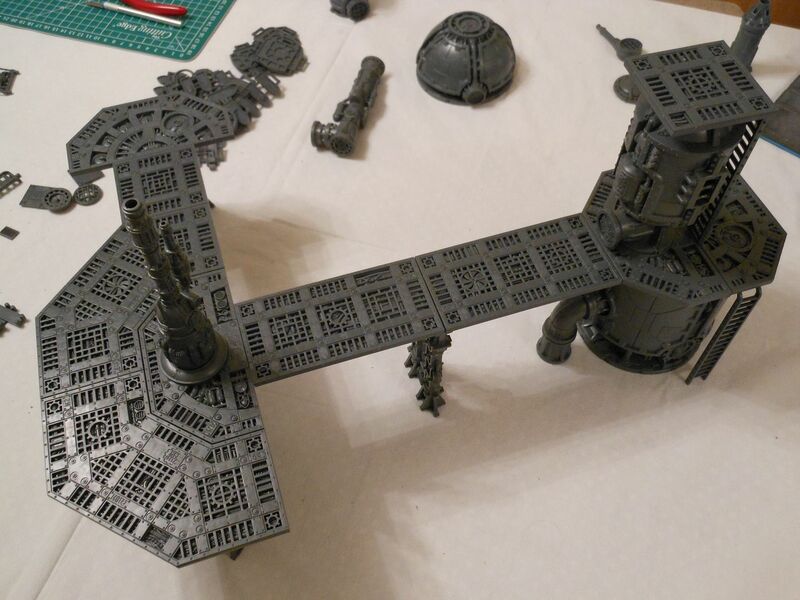 Necromunda, and by extension Shadow War, is all about elevation - about walkways and bridges, and scrambling up (and falling down) ladders - yet this set only includes six walkways and four platforms. Despite the size of it all, there really is very little usable height. While weird, floaty skull claws and dangling cables look cool, they don't add gameplay. I would have much rather seen a few more bits of flat terrain you could stand a model on, and a few less pipes and smoke stacks that don't do anything other than provide tall things to hide behind. Games Workshop has announced five terrain packs so far, and unfortunately none of them address this concern. In fact, all of the kits are different configurations of the same sprues. 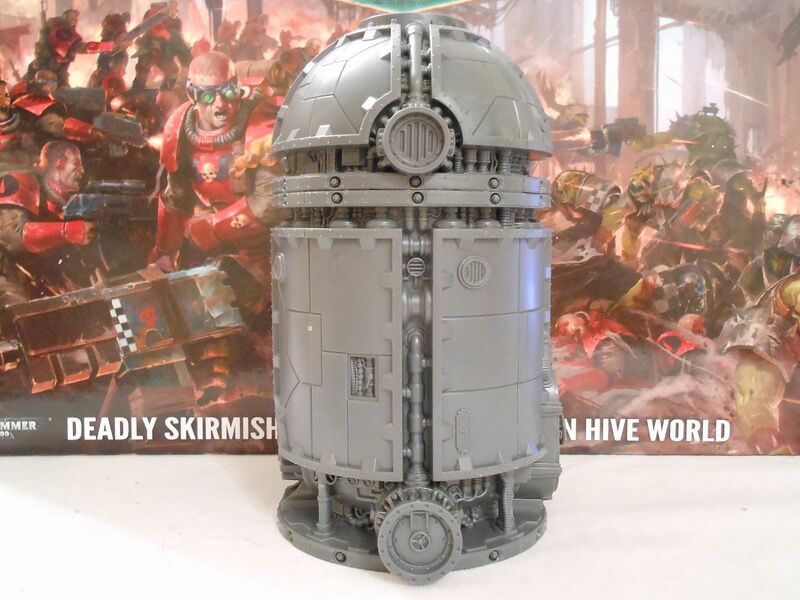 From looking at the product images it looks like the Ferratonic Incinerator is just the Ferratonic Furnace with an extra walkway sprue, while the Galvanic Magnavent is just the Prometheum Forge with an extra walkway. 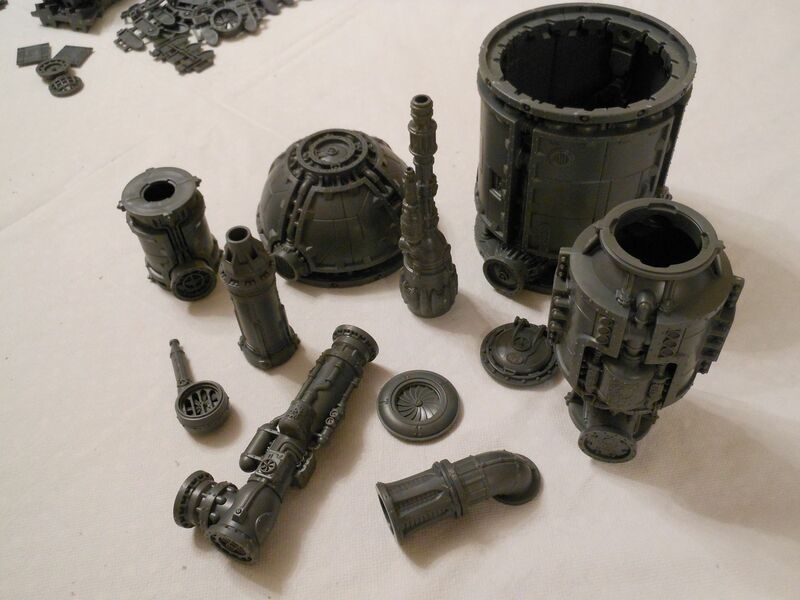 Both the Galvanic Magnavent and the Prometheum Forge contain one of the two sprues that make up the Alchomite Stack. What there needs to be - and what there isn't - is a set containing just the walkways and the support struts. Those are the things you want lots of. Unfortunately, that means buying lots of other bits that I don't feel add as much value. Now, at this point it might start to sound like I am really down on the terrain; but that's not the case. I'm not impressed with the way it's being packaged, and I'm disappointed it isn't more reconfigurable; but I certainly don't hate it. But I don't want to rush out and buy more stuff straight away, so I spent a few hours tinkering with the terrain I've got, and trying to figure out how I could make it structurally sound without gluing it all. Basically, I wanted to make several larger sections that I could put together in different ways to keep things fresh for now. When it came to the gantries, it was immediately obvious that relying on a single brace clip to hold two terrain elements together wasn't going to cut it. A single clip just doesn't hold tightly enough, I fiddled around a bit more, and found that combining several clips can actually create some pretty secure sections. For example, if you want to combine two platforms to create a larger hexagonal platform, using three clips in a "H" formation is very secure; yet as long as you are careful, you can still separate them out when you want to. Playing with the ladders revealed more good news: As they only have a single peg, they are easy to put in and pull out, yet because they are "wedged" between the underside of the platform and the ground, they don't fall out or move. The option to add ladders pretty much anywhere immediately makes the set more versatile. Supporting struts were a problem, They have two offset pegs for a snug fit, yet their shape means they have a tendency to "rock," putting additional tension on the pegs. I realised I was going to have to glue them in place, and decided that the recommended positions from the assembly guide were the best options. The safety barriers and bulkheads didn't clip onto the edges of the walkways securely, and immediately showed signs of stress on the clips, so they got glued. Finally, I glued bracing pegs to the small walkway sections. This makes those sections less versatile (and actually makes it impossible to create the exact configuration from the assembly guide), but they were always very loose and wobbly in my test assemblies so I didn't feel like I had a choice. And yes, it does all fit back in the box. Overall, I'm happy with what I've got. I feel there's enough stuff here to get started with, but if you are playing on a 4x4 table things start to look a little thin. You can just about get away with it if you spread out the smoke stacks, separate the main terrain elements into two or three structures, and add a bit more ground cover; but more terrain is definitely on my wish list, I think a set of the Munitorum Containers is a good shout. If you didn't get the Shadow War: Armageddon start set, you can still get individual terrain kits from all good Games Workshop stockists. Good stuff. I wish there were more of the hanging cables and chains included. I'm finding that they seem to hold the walkways and platforms a bit more securely than the intended clips which will randomly fall out. Yeah, they're very good for helping things hold together (especially the big crab skull) and they never fall out. However, as I was a bit worried about the fragility for some of them, most of mine are glued in place. I do love all those twiddles and bits; but sometimes I look at them and think, "Could have got an extra walkway on the sprue if it wasn't for those." I'll agree on both points. 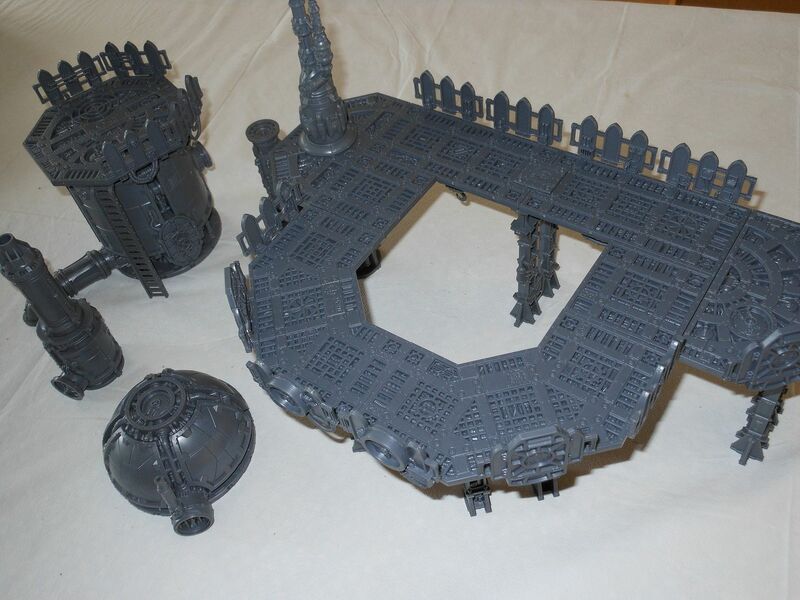 Luckily I've got a pretty big box of card and bulkhead terrain from my Necromunda days to supplement it. Unfortunately, all my Necromunda stuff, including my beloved Goliath gang, is long gone. Do you think that this terrain will fit with overkill board? Interesting question. 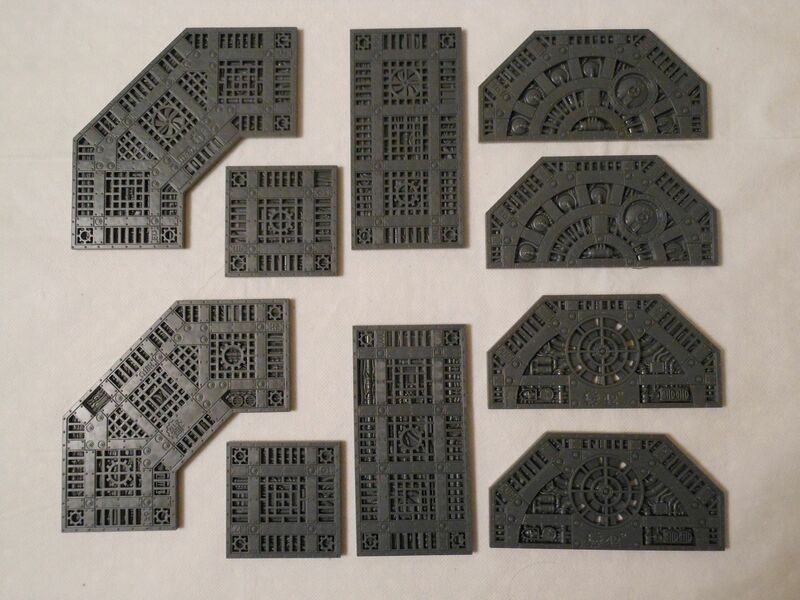 Do you mean, could you recreate board layouts from Deathwatch Overkill using these pieces? Or do you mean, could you use the terrain alongside the boards from Overkill to create a Shadow War battleground? I think you could certainly make approximations of the Overkill boards with the Shadow War terrain, but it would cost you a small (actually quite large) fortune, and you wouldn't have all the zones marked out. If you wanted to use Overkill boards in Shadow War, you could probably arrange the boards as the "ground floor" of a battlefield, and then use the Shadow War terrain to create height above it; but you don't get nearly enough Overkill boards to fill the 4x4 area Shadow War requires. It would actually be really cool. 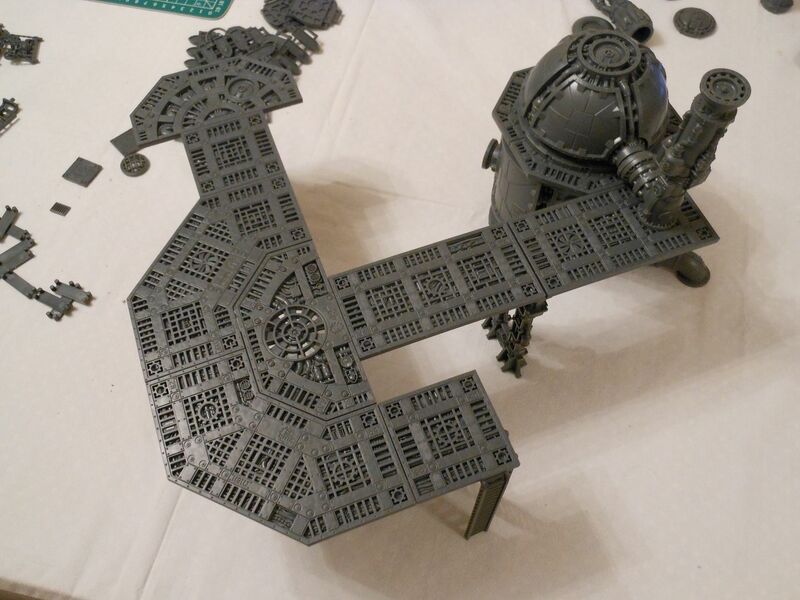 There are no rules in Shadow War that say you have to have a "solid" floor, so a base level made up of Overkill's gantries would be really interesting. However, it would most likely give a firm advantage to teams that rely on ranged weapons, as you would find it more difficult to get units into melee because of all the gaps. Worth noting: Shadow War already has rules for jumping across gaps that would work for jumping between the gantries with a minor modification for what happens if you fail. Have you found the floor plates (that slot into the metal grilles on top of the walkways) provide any structural support? The WD suggests sandwiching joins between one of the small clips and a top plate, and I'm hoping that will do some of the work that would otherwise be done with multiple clips. 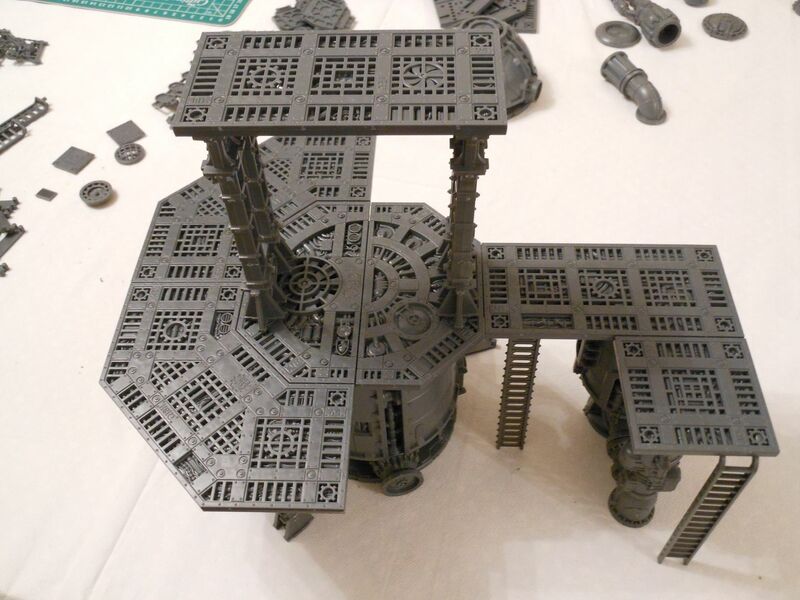 Likewise, they suggest the raised bolts on the hex platform (the two-piece assembly usually used to top the furnace piece) are well suited to keeping the dome in place, as well as other terrain sets like Promethium Relay Pipes or the Haemotrope Reactors- have you been able to try this? The floor plates just sit on top of the walkways, so as-is they don't provide any structural support. However, if you glue them in place they do provide extra strength for the point where two walkways meet. That's how I used them. The raised bolts on the platforms will stop the dome sliding around a bit, but not to the point where it won't fall off if you give it a push. You can see a picture in my article of the dome sitting on top of a platform: That isn't glued in place, it's just sitting within the ring of bolts. Overall, the sets are clearly designed to be glued, but as long as you're careful during games, I think you can get away with leaving stuff in large separate sections like I did. 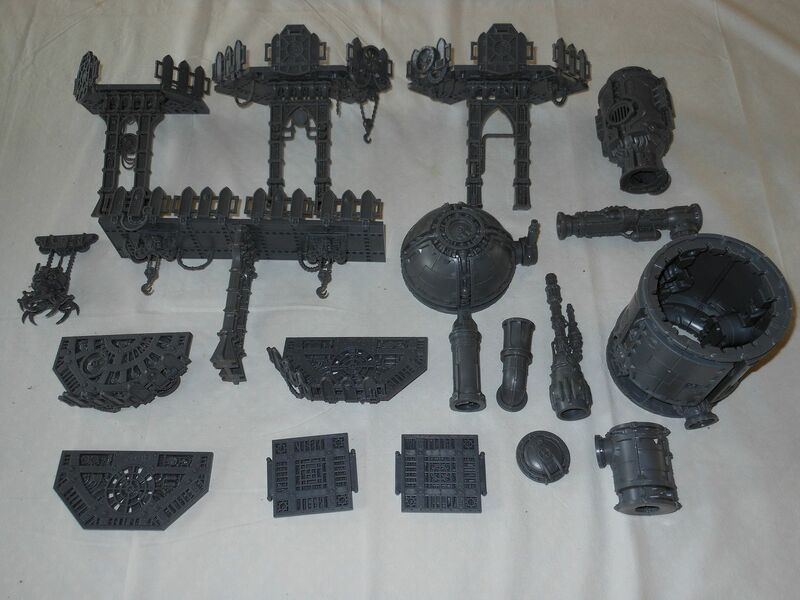 With the imminent release of Kill Team, I've been looking at my unassembled gantries from SW:A and doing some research. This blog post is just what I was looking for! Now that it's a year later, are you still satisfied with the configuration you decided on? Have you gotten good variety out of the sections you decided to glue together? Thank you for this post! It's very helpful.